Today’s trekking was the core of our climate journey. We left Lobuche around 8am and made our way gradually uphill along a broad path to Gorakshep, a settlement perched on a small knoll on the glacial moraine. We were fortunate to have glimpses of the high mountains around us, but growing cloud focused our attention on the mid slope. On the way up, I caught sight of the Italian Pyramid weather monitoring station, installed as part of the SHARE program (Stations at High Altitude for Research on the Environment). After lunch and a rest, we followed the steep moraine ridge, high above the Khumbu glacier to our right. The views were astounding, the path beneath our feet periodically treacherous. Helpful Sherpa porters offering to carry our day-packs made walking easier for several of us. I was grateful for Pemba’s help at that altitude, as breathing was an effort uphill and it was good to concentrate. The smaller melt lakes lower down the glacier were like small green sinkholes in the ice. Further up, we came across a larger lake with two dark holes like train tunnels in the ice wall behind it, revealing where meltwater flows are boring into the glacier from beneath. Closer to Base Camp, a truly enormous glacial lake had small white ice-flows floating on its green surface. Millie, AYCC’s indigenous coordinator and I posed for ‘climate photos’ in front of the lower lakes, wearing AYCC’s “Climate Action Now” and 100% Renewable’s “Build Big Solar” t-shirts. Much jubilation on reaching Base Camp. People wandered around taking photos of each other, all wearing warm clothes and silly grins. 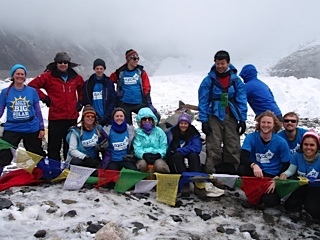 I’d brought my larger Tibetan prayer flags, and we unfurled them to take a group photo in front of the small cairn marking the old Everest Base Camp. 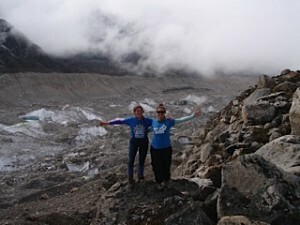 The new one has now moved some 6km further up the glacier, where climbers make their final camp. I was deeply struck by a conversation with Tirthe, our experienced trekking guide. 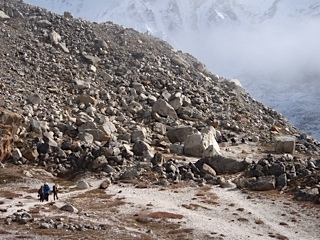 He had last taken a group across to Base Camp only two months earlier and was himself shocked to see how much the landscape had changed in that short space of time. An entire section of the moraine wall had collapsed, the river itself had changed course, and a new path had been made across the valley, including a new small wooden bridge with dokos filled with rocks shoring up its far side. The memory of seeing those ever-growing lakes and ever-diminishing glaciers will stay with me for life. This entry was posted in Activism, Climate change, Environment, Foreign aid and development, Uncategorized and tagged activism, AYCC, climate change, environment, glaciers, solar power by Philippa Rowland. Bookmark the permalink.